...is full of woe. Well, maybe that's a bit of an overstatement but I'm not really happy about the way this one turned out. It's the first of two decorative type hanging things I've made. The other one, which I'll show you tomorrow, came out a little better I think than this one. I'm really not too sure about this one. I'll show you and allow you to make your own judgements. 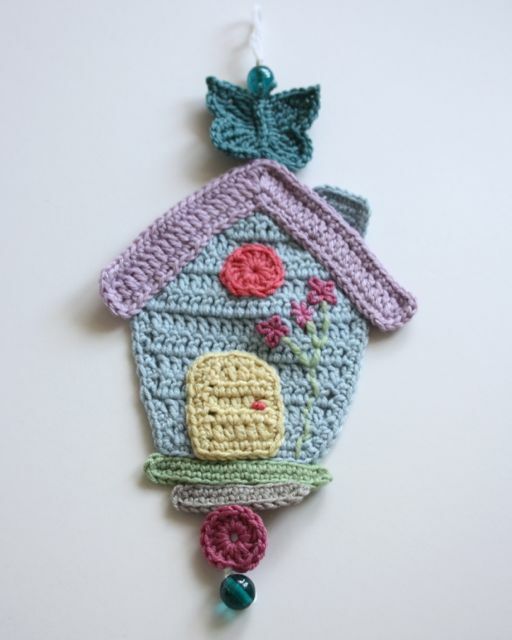 Not entirely happy with the colours I've used, the shape of the house, the type of yarn I used. It needs blocking really and felt backing probably but I've lost the heart for it at the moment. It didn't come together in the way I'd imagined at all. I imagined a sweet and adorable little thing and this just isn't it. Ah well, better luck next time I guess. That's the trouble with my mind's little ideas, they do sometimes come out a bit wonky. Often that's ok. Wonky can work and I can adjust the vision in the mind to accept and incorporate this new reality. Other times, the reality is just too far from the original notion for my mind to be at all satisfied. Like today. I'm thinking maybe felt would work better, or maybe material and appliqué? "It's a work in progress, Mind. We'll try again another day, ok?" "Ohh, I like the felt idea. With nice stitching?" "That's it Mind, now you're thinking again!" "I did quite like the crochet butterfly though..."
"Me too. Maybe we'll keep him." I agree with the previous comments- it's really sweet. Well I for one thinks its very cute. This one is cute! Is there a pattern availeble?